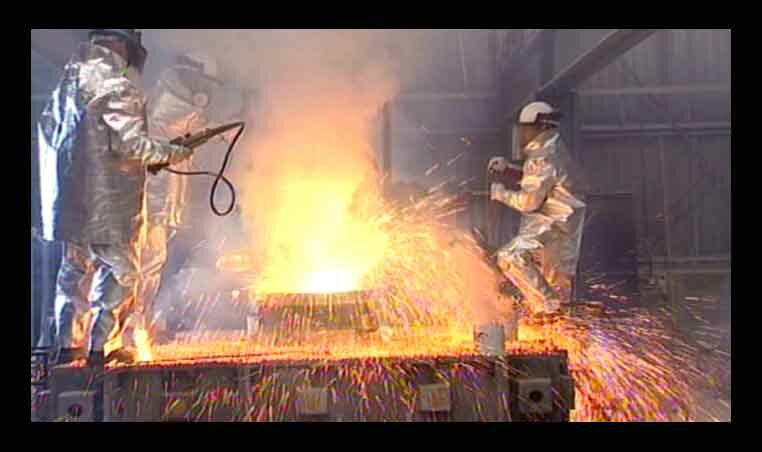 A Documentary Film by Andrew Mckay 60 mins. 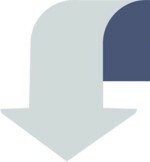 Editor: David Sleight Sound Composition: Ronnie Fowler. Cinematography: Luisa Cacioppo, John Stewart, Andy Mckay, Graham Forde. Launched at a reception hosted by the Government of Bermuda, the film was premiered at the Tradewinds Auditorium in The Bermuda International Film Festival in March 2007 and received a standing ovation. The UK Preview took place in June 2007 at the Broadway Cinema Nottingham. Bermuda Sun " Andy Mckay gives us a fascinating profile of one of the artists that helped lay the foundations of Black British Art in the UK " Bermuda Royal Gazette " The film is a candid portrayal of the artist, but also the artistic process" WordPress.com " I wish there were more films like this"
INTA FILMS 43 Farndon Rd. Newark, Nottinghamshire, NG24 4SQ UK. FILM STILL - Bill Ming in his Studio. 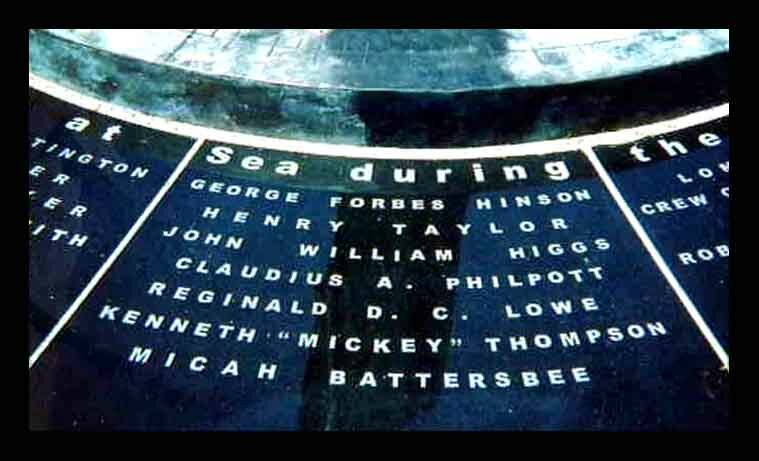 In 2004 and the aftermath of hurricane Fabian the Government of Bermuda decided to commission a memorial to Bermudians "Lost at Sea". 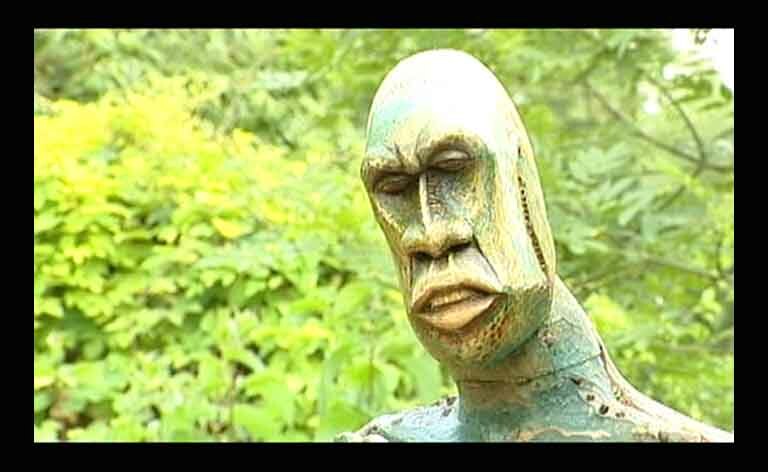 The subsequent competition for the islands first piece of public art was won by Bermudian born and internationally renowned sculptor Bill Ming, who has spent much of his life working in Nottinghamshire, England. 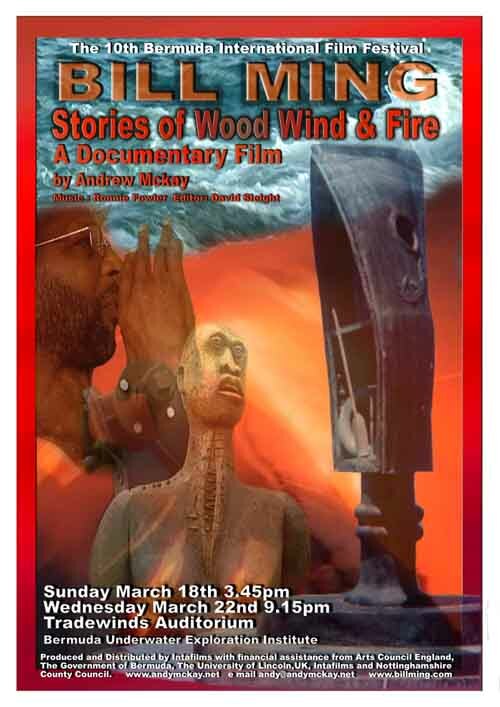 Andrew Mckay's film is a fascinating and poetic portrait of the sculptors early years in a segregated society, as a seaman and upheaval of cultural adjustment of coming to England in 1970 followed by survival as an artist. It explores the themes and ideas that have driven his art over three decades, his African and ethnic American roots as well as his departure from and subsequent recognition by Bermudian society. The film weaves together his remarkable work, emotional and humorous life stories, with the making of the 12 ton bronze memorial sculpture in the UK and its shipping across the Atlantic to a final cliff top resting place in Bermuda. In its subsequent unveiling the monument seals a lifelong ambition for Bill whilst revealing equally defining moments of meaning to Bermudian people. The still features a polished granite disc surrounding the base of the memorial. Designed by Bill, produced in China and shipped to Bermuda, the disc is enscribed with the names of Bermudians lost at sea over several centuries. Bill Ming discusses the construction of the components of the bronze memorial at the foundry in Braintree Essex. 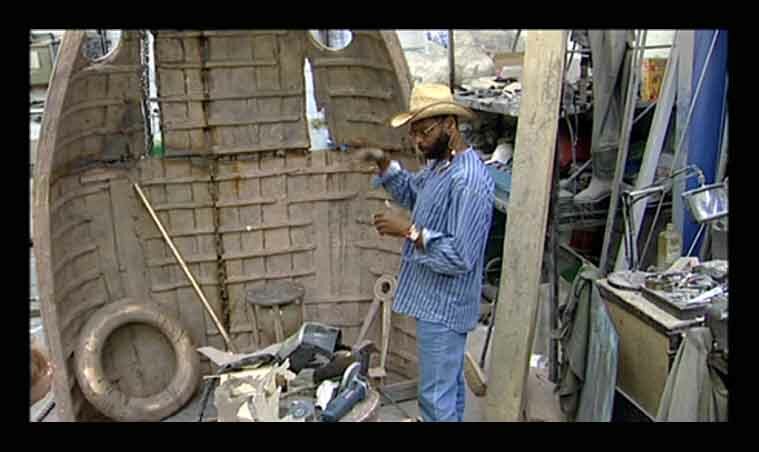 The construction of the bronze monument took place over a full year - in Bill's studio Newark UK, at Morris Singer Art Founders in Essex and at Great Head Park, St Georges, Bermuda. 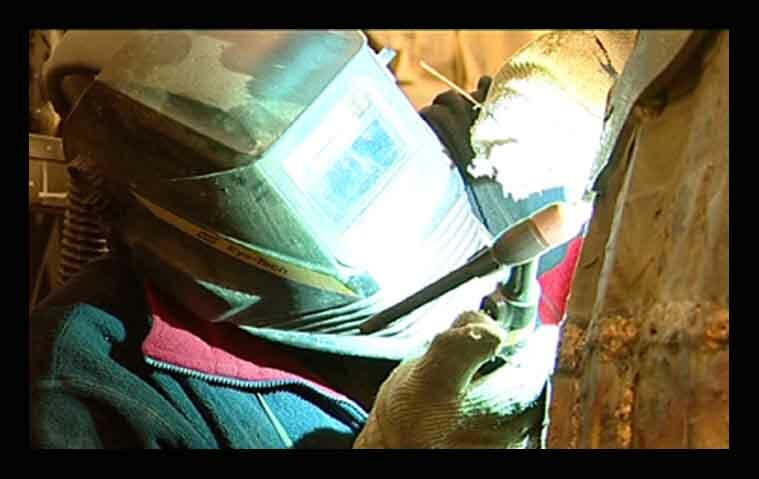 The still features Chaz Dearing welding together sections of the sculpture. 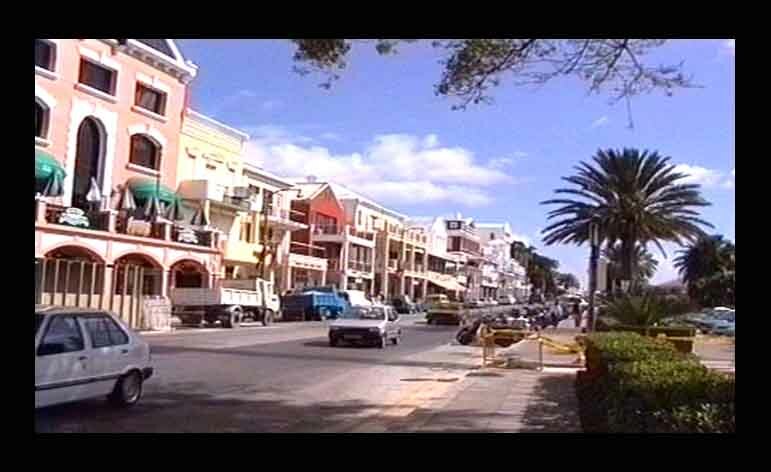 FILM STILL - Hamilton, Bermuda. Front St. Hamilton, Bermuda. Shooting the film involved visits to many locations over 13 years including three to Bermuda covering childhood haunts, a homecoming exhibition at the Bermuda National Gallery opened by HRH The Queen in 1993, the monument unveiling and many other stunning locations reflecting Bermudian history. 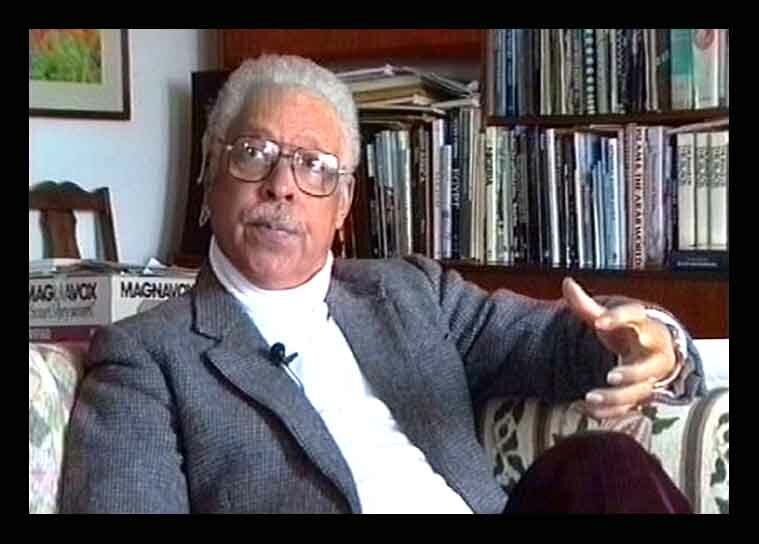 The film features comment from eminent Bermuda historian - the late Cyrill Packwood, author of "Bermuda in Chains". Cyrill describes the significance of Bill Ming's work in the context of the history of Bermuda and its society. 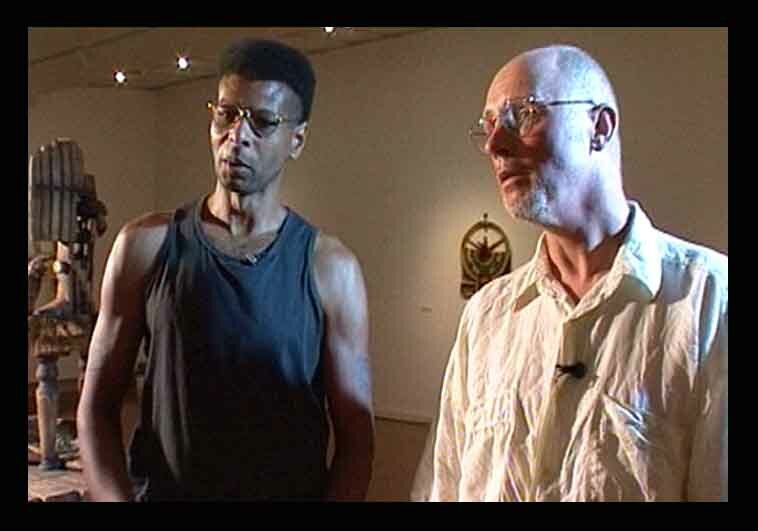 The film includes a conversation between Bill and sculptor Malcom Poynter about Bill's early days in conflict with the Art College system of the 1970's and a range of his sculptures in wood. In addition to the creation of the Lost at Sea Memorial bronze, the film also features a wide range of Bill's sculpture in Wood. The still featured here is part of a piece entitled "Family Circle" which was bought by the City of Hamilton and now resides in The Bermuda National Gallery.